Whether by deft planning or stroke of luck, Mitsubishi has found itself in an enviable marketing position. 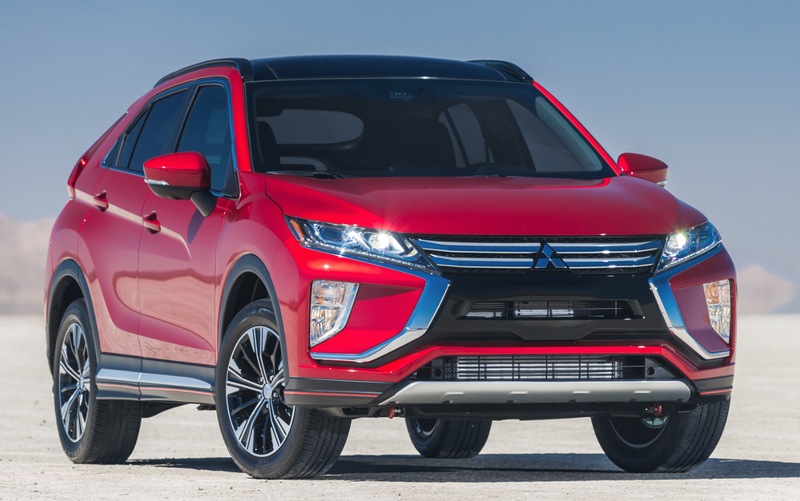 With the introduction of the new Eclipse Cross compact crossover slated for next spring – and the dropping of the electric i-MiEV and long-running Lancer sedan – Mitsubishi will be fielding a lineup of three crossovers and one car line (the slow-selling Mirage) for 2018. That puts the bulk of its wares in the hot-selling “small crossover” segment. Actually, that’s two segments now. 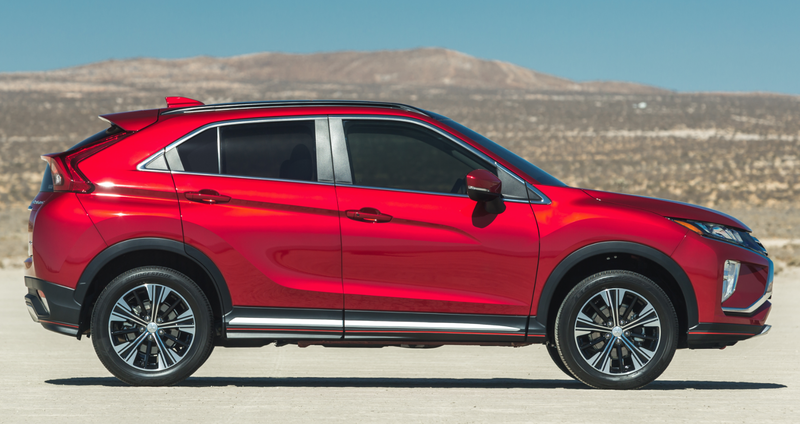 Due in part to the number of really small crossovers recently added to the mix, they’ve been granted their own “subcompact crossover” category, and their number is growing by leaps and bounds. 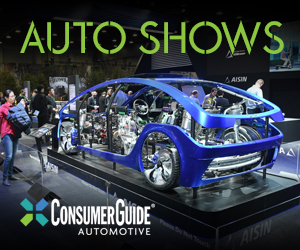 That’s where Mitsubishi’s Outlander Sport plays, and it’s the company’s best-selling model. In the compact-crossover segment – currently the top-selling one in the industry – Mitsubishi has only offered the Outlander, a largish entry with available 3-row seating and V6 power. While that’s a combination that sets it apart from its rivals, it left a big gap in Mitsubishi’s model lineup. That is, until now. 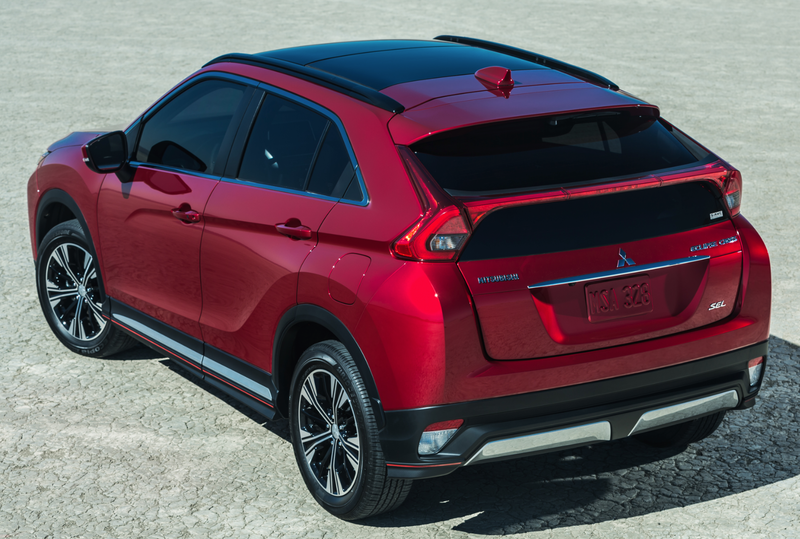 While its face carries Mitsubishi’s corporate “Dynamic Shield” styling theme, the back end of the Eclipse Cross is more distinctive — and dramatic. However, the sloping rear roofline cuts into cargo space a bit, and the hatch includes a cross bar (carrying the horizontal taillight lens) that obstructs rear visibility some. As evidenced by both its look and its name – “Eclipse” being previously assigned to the company’s former sports coupe – the new Eclipse Cross leans toward the sporty side of the segment. From the appearance standpoint, that’s best illustrated by its rakish stance, sloping back window, and sculptured rear end. Looking at the vehicle’s specs, however, it would seem that’s about as far as the “sport” aspect goes. But that’s not entirely the case. The only powertrain offered is a 152-horsepower 1.5-liter turbo four mated to a CVT automatic transmission. That wouldn’t be particularly noteworthy even for a subcompact crossover (the Outlander Sport is offered with a pair of larger engines boasting up to 166 horsepower), but we found the combination worked well enough. There’s only a hint of turbo lag when the throttle is floored from a stop – the action resulting in a decently strong jump off the line – and it’s virtually non-existent when the throttle is stabbed at speed, with the transmission’s quick kickdowns aiding in providing good passing response. Still, overall acceleration is good rather than great, leaving the “sport” aspect to be covered by overall handling. And in that, the Eclipse Cross seems to deliver. Our preview route near Los Angeles included twisty roads with many tight turns, and it’s there that the Eclipse Cross demonstrated its sporty moves. Ride was more difficult to determine – the smooth roads affording few bumps – but it seemed to be fairly compliant. More on that when we get to test one around our Chicago office. Padded surfaces abound inside the Eclipse Cross’s cabin, and relatively thin front roof pillars provide good forward visibility. One of the strongest selling points of the Eclipse Cross is its value equation. Four trim levels are offered – ES, LE, SE, and SEL – and all come standard with all-wheel drive except the base ES, where it’s a mere $600 option. Standard on the base front-drive ES — which starts at $24,290 including the $995 destination charge — are all the usual items plus heated power mirrors, automatic climate control, and rearview camera. Added on the $25,890 LE are black wheels and trim, 7-inch touchscreen, and Apple CarPlay/Android Auto functionality. Expected to be the most popular model is the $27,390 SE, which adds a host of features such as heated front seats, keyless access and starting, rain-sensing wipers, blind-spot and rear-cross-traffic alert, and the company’s new Mitsubishi Connect telematics system, which includes emergency and road-side assistance, remote climate control and door lock/unlock, car finder, and parental controls. Standard on the top-line $28,890 SEL are leather upholstery, 8-way power driver seat, a head-up display, and 360-degree camera. Added in the optional $2500 Touring Package are a dual-pane panoramic sunroof, premium audio system, and heated steering wheel and rear seats, along with forward collision warning/mitigation, lane-departure warning, adaptive cruise control, and automatic high beams. Step inside the Eclipse Cross, and – at least on the top-line SEL with Touring Package we tested – you’ll be greeted by numerous soft-touch surfaces, as the dash top, door tops, and armrests are all padded, with gloss black and silver trim providing some nice contrast. Cabin storage is good but not great, consisting of a large glovebox, moderate-size two-tier console box, two console cupholders, a large forward console bin under a 12-volt and two USB plugs, and map pockets in the doors. Although the Eclipse Cross is on the small side for a compact crossover, interior room is – or at least, can be – quite good. Legroom in front is adequate rather than great, though there’s ample headroom, and egress is easy thanks to largish door openings and the usual crossover ride height. Nice touches include undercut door openings at the bottom that reduce the chance of rubbing your pant legs against dirty sills, and the power driver seat on our SEL-T tester included a tilt cushion. In back, a sliding rear seat and relatively long 106.4-inch wheelbase allow for great rear-seat legroom, even if the front seat is pushed far back. If you don’t need that much, the seat can be slid forward about eight inches to expand the cargo space behind it. 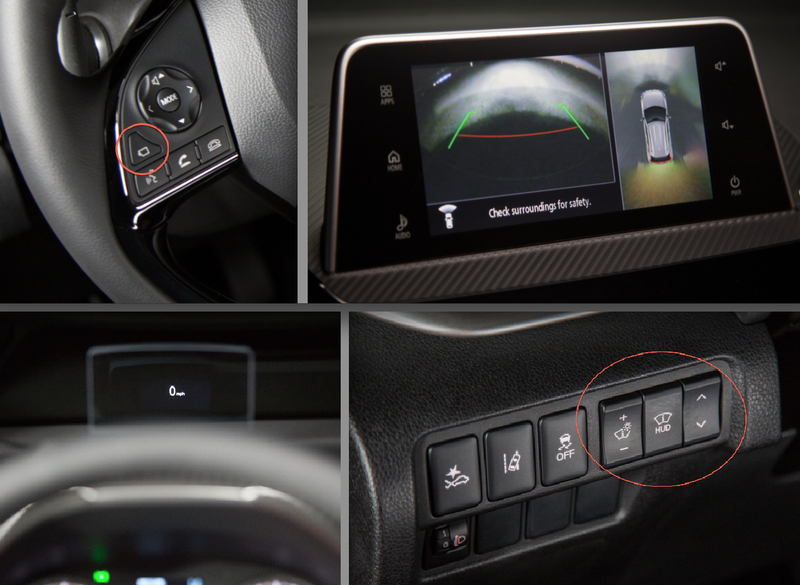 Neat features included in the top-line SEL are a 360-degree camera that can be activated by a button on the left steering-wheel spoke (top row), and a head-up display with adjustment buttons on the lower left of the dashboard (bottom row). Those button placements are noteworthy as being about the handiest in the industry. Visibility is good to the front, OK to the sides, but rather poor to the rear corners due to thick pillars. However, the rear headrests can be lowered to overlap the seat backs to clear the view straight back, though that view is hindered by a horizontal bar that bisects the rear hatch. The standard rearview camera helps when backing, and the tested top-line SEL with Touring Package also had a 360-degree camera. The highlight of the latter is that it can be activated by pressing a handy button on the steering wheel – the most convenient placement I’ve seen, which really helps to use it when you might otherwise not. So real kudos to Mitsubishi for that. A 7-inch touchscreen is standard on all but the base SE model, but it includes no knobs; all audio adjustments need to be done either on the screen, the console touchpad (lower right), or with redundant steering-wheel buttons. Both the touchscreen and the climate controls are a bit out of easy reach. Meriting less in the way of kudos is the control layout. The audio system lacks both volume and tuning knobs, and though the former can be adjusted by a steering-wheel flipper or by a double-finger swipe across the console touchpad (which can also be used to make selections on the touchscreen), the touchscreen volume adjustment is by tedious repetitive-step pushbutton. Tuning in a new station is also more trouble than it should be, as is switching radio sources or station presets. Furthermore, the touchscreen is a bit out of easy reach, as are the climate controls, which eschew simple knobs in favor of another slew of repetitive-step pushbuttons … which – if you haven’t figured it out – are not a favored form of adjustment. Despite the sloping rear window and rather narrow cargo area (which was even narrower in the tester SEL-T due to a large speaker being embedded into the right-side wall), there’s a decent amount of storage space in back considering the vehicle’s size, and there’s some additional “hidden” storage space under the floor. As noted above, the Eclipse Cross offers a fairly complete selection of high-tech safety features, but what many consider the most important of them – forward collision warning and mitigation – is only offered on the top-line SEL in its optional Touring Package. 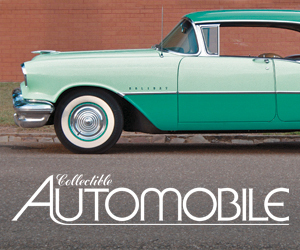 Since many competitors (and even some low-priced cars) include it as standard equipment, this choice strikes us as rather odd – and unfortunate. But that aside, the Eclispe Cross comes off as an enticing entry in the popular compact-crossover class. And it makes a great addition to a Mitsubishi lineup that now covers a wide spectrum of the segment – and will soon get wider. As its rakish profile implies, the Eclipse Cross sits at the smaller, sportier end of the compact-crossover segment, where it has relatively few direct competitors. Written by: Rick Cotta on December 11, 2017.on March 22, 2019.